What's New in MacVector 12.6? The most significant addition to MacVector for the 12.6 release is a new interactive "Quicktest Primer" primer design tool that simplifies the identification and testing of primers for PCR and sequencing. Other enhancements to MacVector include the ability to import features from BED, GFF, GFF3 and GTF files, improvements in graphics performance for genomes with many features and revised melting temperature calculations to use more recent algorithms. A full list of the changes can be found in the Release Notes. 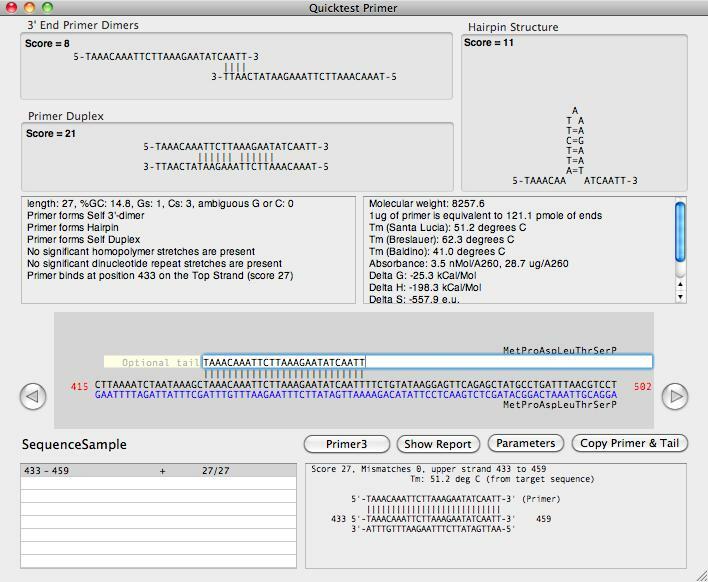 The main editor pane also shows the primary binding site of the primer on the currently active sequence window (if one is open). Any secondary binding sites are shown in a scrolling list and can be clicked on and directly viewed in a separate alignment panel. You can also add a tail to the primer (e.g. containing a restriction site) in the "Optional Tail" box. All of the Tm, hairpin/dimer/duplex, absorbance, molecular weight etc calculations then take the tail into account, but the reporting of template binding sites is unaffected. A useful "Show Report" button opens a window summarizing all of the properties on a single PDF page, great for printing out and inserting into a lab notebook. Once you are satisfied with a primer, you can click on the "Primer3" button to find a matching primer for a PCR reaction. The Primer3 interface has been modified so that it understands any tails that have been added. You can add tails to any matching primers found by Primer3 and then copy the predicted product to create a new sequence, complete with mismatches and tails, representing the fragment produced by the PCR experiment.